In honor of AIDS activist Martin Delaney, the National Institutes of Health (NIH) and the National Institute of Allergy and Infectious Diseases (NIAID) in 2011 sponsored a new funding program designed to foster public- and private-sector collaboration in the fight against HIV/AIDS. 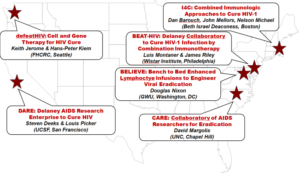 FIX THIS, the program, named Martin Delaney Collaboratory: Towards an HIV-1 Cure, is dedicated to supporting new curative strategies that encompass key areas of basic and clinical research. The first period of funding spans 2011-2016. A second, five-year funding period will commence in 2016. To learn more about the NIAID’s HIV cure research, HIV cure-related Funding Opportunity Announcements (FOAs), concepts for future initiatives and funded grants, visit their HIV/AIDS Cure Research website. Activist, leader, public health hero. There are few people who have had a greater impact on HIV/AIDS health policies than Martin Delaney. From the time HIV was recognized as a public health threat in the early 1980s and leading up to his death in 2009, Delaney worked tirelessly as an educator and advocate for HIV/AIDS patients. Delaney was internationally recognized for his work to change domestic health policy by expediting FDA review and approval of HIV/AIDS therapies. Successfully lobbying for a fast-track approval process, he played a key role in significantly reducing the time it takes for new and emerging drugs to reach the hands of patients. His efforts likely led to thousands of lives being saved. He served on numerous public health policy groups including the NIAID AIDS Research Advisory Committee (1991-1995), NIAID’s National Advisory Allergy and Infectious Disease Council (1995-1998), Fair Pricing Coalition, Board of the Foundation for AIDS. Delaney founded Project Inform in 1985 and served as its Director until 2008. Based in San Francisco, the organization continues to raise public awareness and lobby policy makers on HIV/AIDS issues. Learn more about Martin Delaney and his founding organization, Project Inform.